Like most provincial communities, my home town of Newton-le-Willows has succumbed to the rising influence of the great British curry. A veritable phalanx of spicy food emporiums have come and gone. That said a good number have been here a good while now. “The Fort of India”, “Balti Towers”, “Shajahan”, “Belash” to name but a few, have seemingly found a niche in the local gastronomic scene. 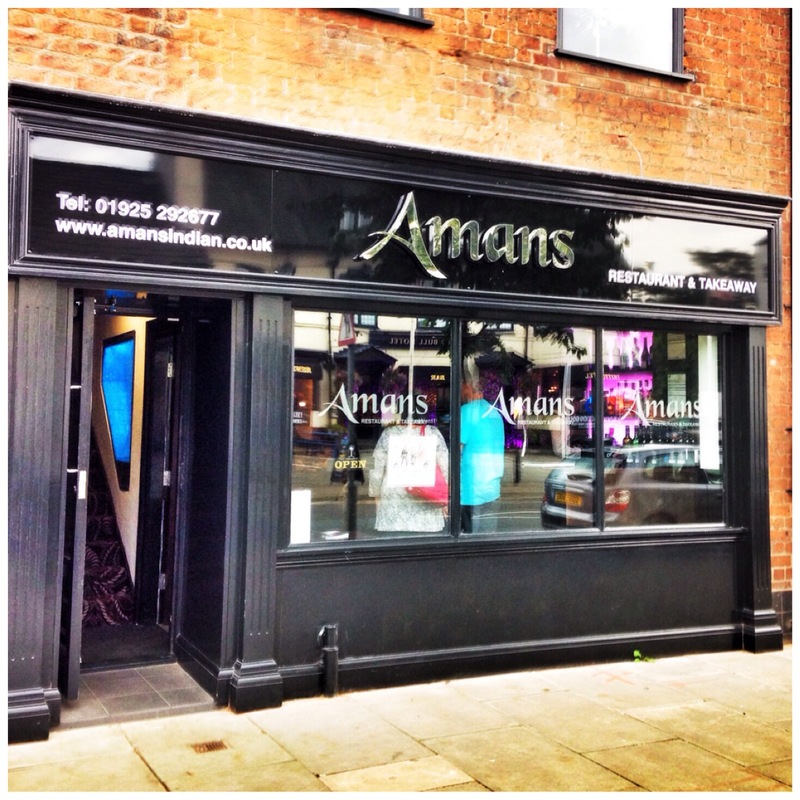 However, theres a new kid in town, ‘Amans’ has rooted a dark almost satanic frontage smack bang in the middle of (a faintly resurgent) Newton High Street. It has an even more imposing gaff a few miles away down the East Lancs at Astley. On that occasion the old “Queens Arms” succumbed, at Newton it was merely a solicitor that went pop! (I think!). Amans it seems is taking over the North West with Congleton, Lowton and Bramhall either fallen or next in line. So what’s it like? It’s pretty good really. I could stop there but I won’t (groan – Ed). I feel I should set this review in context. Owing to The flames virtual intolerance of Indian food it is very rare The Cooktwit gets to indulge in the fruits of Indian cuisine. 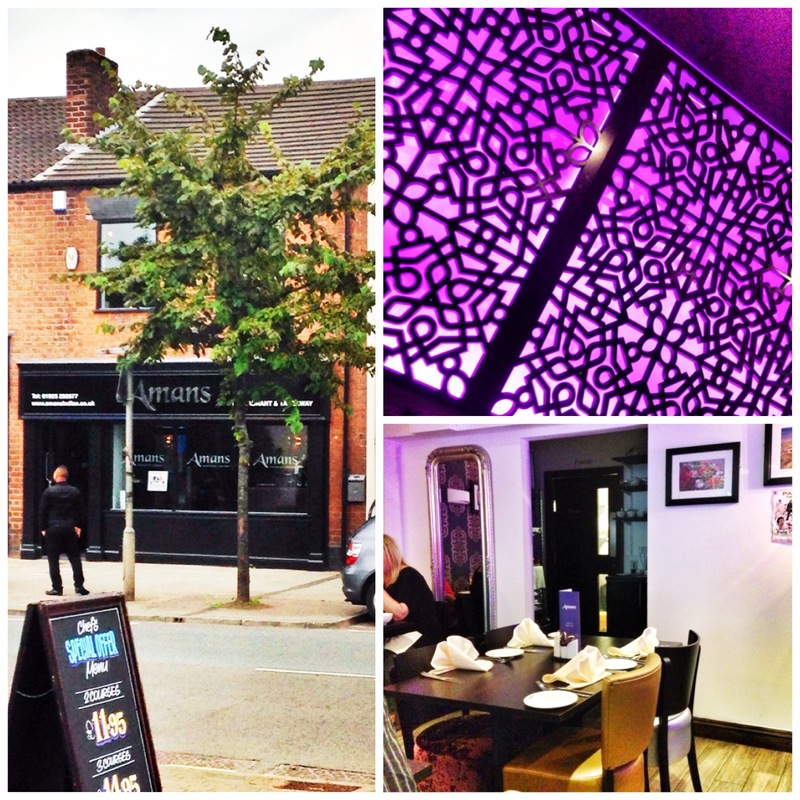 That said, out with the boys a few months back I had a glorious meal at Mughli on the curry mile in Manchester which was sensational and is reviewed here on the blog, Amans has a tough benchmark to match. As I have mentioned black is the main colour, helped along by a purple neon edge. Long gone are the mismatched tables and paper tablecloths. New Indian restaurants nowadays endeavour to ooze sophistication. Amans is no different. As it’s new it is smart. A purple backed, fret cut, wall matrix serving as the feature backdrop. A bizarre wall of plaster ceiling roses forming the way up the stairs to the upper floor and the loos. The neon purpleage matrix, smart outside and in. Believe it or not The Flame was here on this occasion. Along with six others we were celebrating the flight of leading nephew Ben as he bolts off to China on a teaching shindig. A ‘swifty’ in the Pied Bull across the road meant at least one decent pint could be had before I had to have Kingfisher! 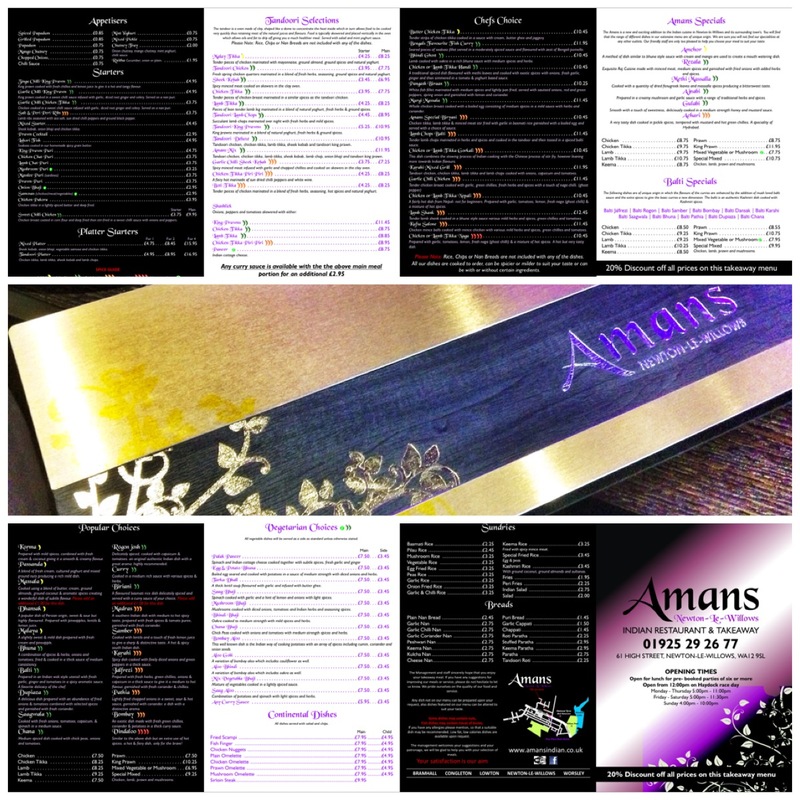 As is the norm in most Indian restaurants, Amans present us with a luxurious, metallic, golden tome. It takes hours to get through. In my eyes it presents the first negative comparison with Mughli. Their entire menu is presented on the side of one card. It is the work of a moment to select your meal. With the miriad of dishes and sauces on offer I am reminded of the TV programme ‘The Restaurant Man’. If you are not familiar, the premise being that a handsome cove, well versed in what makes a successful foodie joint work, trots round to would be owners and tells them where it’s all going wrong. One episode featured some good natured Asian ladies who had the laudable idea of cooking and selling real Indian food, just as their grandma had taught them. The snag had been how they could create their wonderful dishes to the scale they needed to make some cash. A head chef was hired. He immediately purchased a huge vat and an industrial ‘whizzer’ in order to create huge quantities of the ‘base’ sauce. Every dish would therefore start off as this but then have a little something extra added just prior to service to create a ‘different’ dish. It was incredibly off putting for me. Im not saying Amans do this but I sense many Indian restaurants do this in order to service these vast offerings. I digress though. In order to make sure my experience of Amans is not tainted, the flame and I opt from the non standard half of the menu. It makes a pleasing change. I go for ‘Tahori Fish’ to start, pieces of seabass in a light batter (£4.95). Two pieces of beautifully cooked fish, marred slightly by the appalling effort of a garnish. Why restaurants think we diners appreciate scrags of limp lettuce, a shred of onion and an olive is beyond me, but it seems to be ‘de rigeur’ in some places. The flame trooped home in first place with some stunning pieces of chicken. Called ‘MalayTikka’ (£4.25) Tender pieces of chicken marinated with mayonnaise, ground almond, ground spices and natural yoghurt. I managed a morsel and have to say it was superb and moist. The salad was from the same pot as mine! Sadly I didn’t manage to get a pic as she had wolfed it in no time. For mains we again went off beam and came up trumps. The flame probably won again ‘Pangash Biraan’ (£10.25) described as white fish fillet marinated with medium spices and lightly pan fried, served with sauteed onions, red and green peppers, spring onion and garnished with lemon and coriander. The fish was superb, beautifully cooked with a light spicy, seasoned coat. The flame had to shove the mound of onions off to one side (there was no peppers or spring onion garnish) but other than she said she would come again just for this. Can’t say fairer than that. The same scraggy garnish made it to the plate! 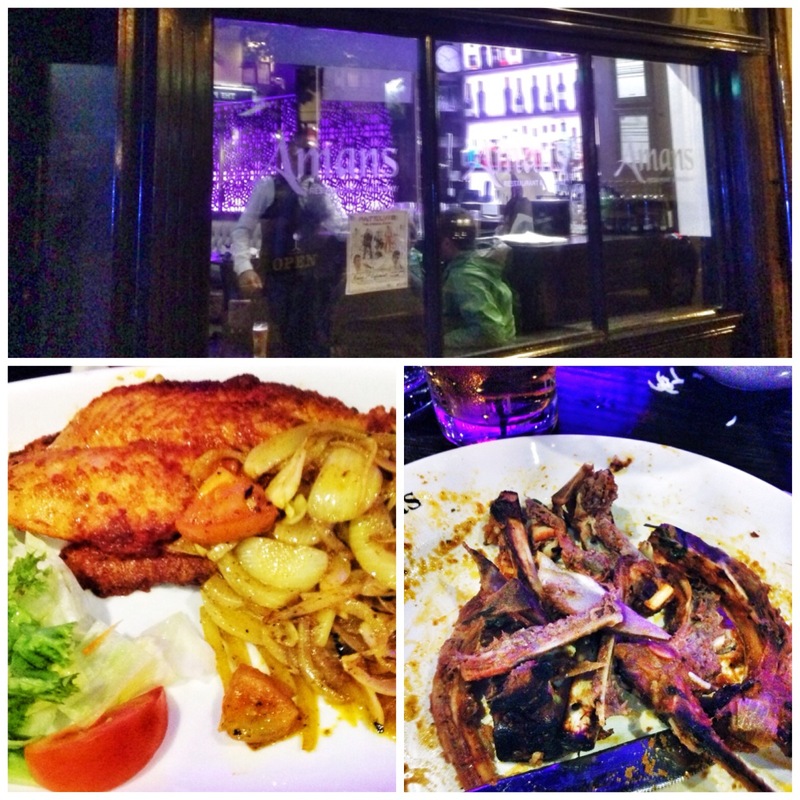 I went for a ‘Lamb Chop Balti’ (a slightly whopping £11.45, but boy this was good. Five, tender chops wonderfully cooked in a rich tasty sauce. They were very pleasant. I left a mound of dry bones and mopped up the sauce with some boiled rice and a chapati. The desserts on offer were the usual freezer based ice creams, no ‘Rasmalai’ I’m afraid. At least the well turned out waiters laughed when I asked for it! If you’re in Newton le Willows and want an Indian you really couldn’t beat it. 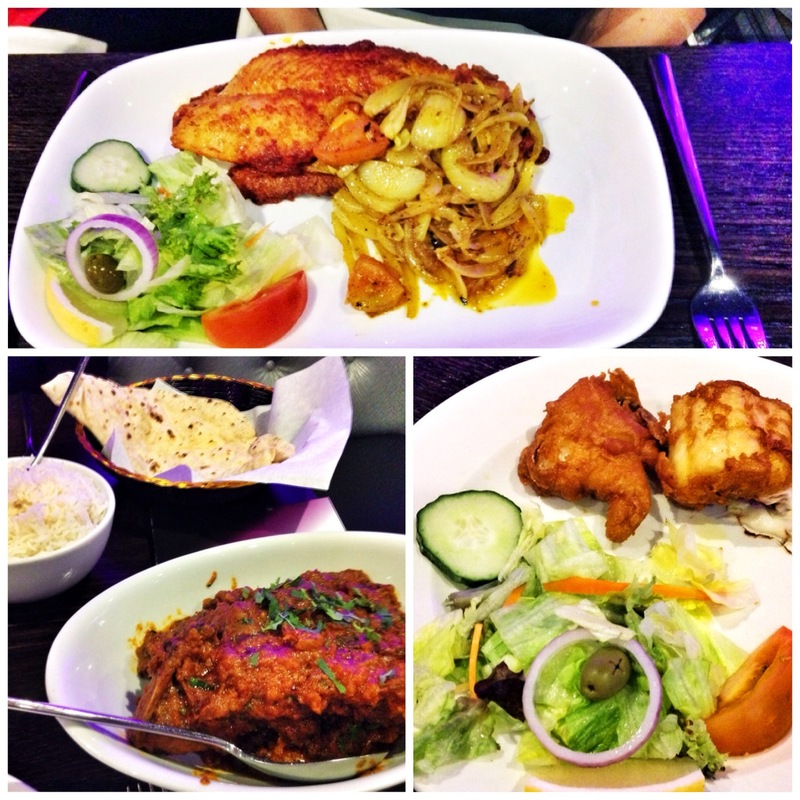 It is probably the best Indian in Newton! But, if you want to try something a little different and have the time I would see if Mughli have a table and get the next train to Oxford Road, then a £5 taxi to Rusholme. Explore the simple menu and enjoy. It cost us £50 a couple at Amans. I reckon you wouldn’t spend much more going down the curry mile. A welcome addition to Newton though. We will go back (if they let me! ).